Rogers rushed for 5204 yards and 33 touchdowns in a college career capped by winning the 1980 Heisman Trophy. He was taken first overall by the Saints in the ’81 NFL draft and moved directly into the starting lineup. Saints went 4-12 to finish fourth in the NFC West while ending up 25th in the league in total yards (4705) but seventh in rushing (2286). 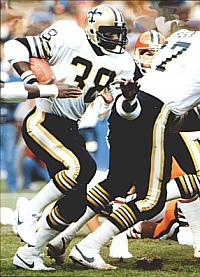 After showing an impressive durability as the primary offensive weapon for the Saints as a rookie, Rogers dealt with nagging injuries during the strike-shortened 1982 season, but was still chosen for a second-straight Pro Bowl. Knee problems kept him out of three games in ’83 as he rushed for 1144 yards, often in tandem with RB Wayne Wilson. Splitting time with aging star RB Earl Campbell in 1984, Rogers rushed for 914 yards and was traded to Washington in the offseason. Once again he was sharing time with a fading great player, RB John Riggins, and while he started just five games, he rushed for 1093 yards with a career-high 4.7 average gain per carry. Rogers took over the starting role in ’86 and gained 1203 yards while scoring a NFL-leading 18 touchdowns. But following another injury-marred year in 1987, Rogers retired. In all, he played seven seasons and ran the ball 1692 times for 7176 yards (4.2 avg.). Never much of a receiver out of the backfield, Rogers added 368 more yards on 55 catches. All 54 of his touchdowns came on the ground.